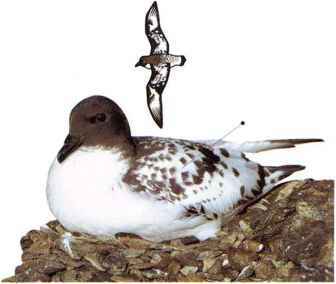 A stout-bodied seabird with a rounded head and thick bill, this species occurs in color phases (seep. 13) from gray-and-white to dark blue-gray. It flies strongly, alternating a few quick wingbeats with a glide on stiffly spread wings. When feeding, it catches fish at the sea surface or dives to depths up to several feet, taking small animals drifting in the plankton. Flocks also gather around fishing boats for offal. Fulmars nest on coastal cliffs, singly or in noisy colonics. • NEST Kggs are laid on a bare ledge on a cliff or crag. • Distribution Breeds on N. Atlantic and N. Pacific coasts. Disperses out to sea in winter.